British expat mum & wife blogs about family life in singapore. Reviews, news, opinions, family holidays & travel, parenting, shopping and having fun. 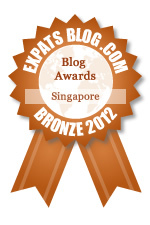 ExpatsBlog.com Expat Blog Awards 2012: Singapore Bronze Award! This blog won the Bronze Award for best expat blog in Singapore! Love the interesting topics on this blog - keep up the stimulating local and international topics coming! Great blog posts from 21st Century Mummy, really useful and full of new ideas. Great blog on a broad range of activities - particularly useful when trying to think of a way to keep the children entertained. Great tips for getting out and about with kids in Singapore. Love this blog! As another expat Mummy in Singapore I can relate to so many of the topics and I often mine it for good ideas. I can always relate to the parenting topics posted, and 21st Century Mummy has her finger on the pulse of what's new for expat parents in Singapore. Always interesting, reminds me when I was back there! We love reading these in the office when we get a break... or even when we don't. Love this blog for keeping up with the latest and greatest out and about in Singapore, for expat mums and kids alike. A breath of fresh air. Keep it coming 21st Century Mummy! a very funny read with lots of great ideas of what to do with children around Singapore, I think it's fantastic! With little ones in Singapore, this blog is great for reviews on products and things to do to keep them busy. Fantastic blog - both informative and entertaining for the reader. Great ideas for things to do with kids in Singapore. Love it! I look forward to my 21st Century Mummy blog posts popping up in my reading list because they're relevant, interesting and informative, especially with 2 littlies. Always makes for good reading and full of useful and constructive ideas. Love the writing style and topics.